Obi Kaufmann Art by Natalie Cartwright, Joseph Kowalczyk, and Monica Van den Dool. When it comes to group shows, it can be hard to find a common thread where one might not actually exist. But that doesn't mean there aren't artists worth mentioning. Here are ten who may or may not be at the mercy of their gallery neighbors. 10. Wayne Armstrong: Luminescent abstraction that connects contemporary and traditional Bay Area landscape painting. Remember oil paint? Turns out it's beautiful. Split Milk runs through March 30 at Manna Gallery (473 25th St., Ste. C, Oakland, 510-282-2335, MannaGallery.com). 9. Lowell Darling: A long, personal history of subverting the conventions of object-making in a show that is refreshingly tongue-in-cheek. This guy's story is hilarious and inspiring. This Is Your Life runs through March 24 at Krowswork Gallery (480 23rd St., Oakland, 510-229-7035, Krowswork.com). 8. Jody Medich: Simply presented subject matter, existential in its expert rendering. Who knew chairs could be so enthralling? Chairs runs through March 24 at Mercury20 (475 25th St., Oakland, 510-701-4620, MercuryTwenty.com). 7. Marcos LaFarga: Graphic vision that seamlessly ties together an urban sensibility with a conscious sense of art history. Through March 30 at Sticks + Stones (815 Broadway, Oakland, 510-689-1280, SS-Gallery.com). 6. Natalie Cartwright: Delicate, figurative, multimedia sculpture with a simplicity that belies deeper issues. Woven Through Time runs through March 30 at Vessel Gallery (471 25th St., Oakland, 510-893-8800, Vessel-Gallery.com). 5. Monica Van den Dool: Bright ceramics that subvert "cutesy" with a scale that invokes a more disturbing vibe. Giant dead canaries have never been so strangely beautiful. 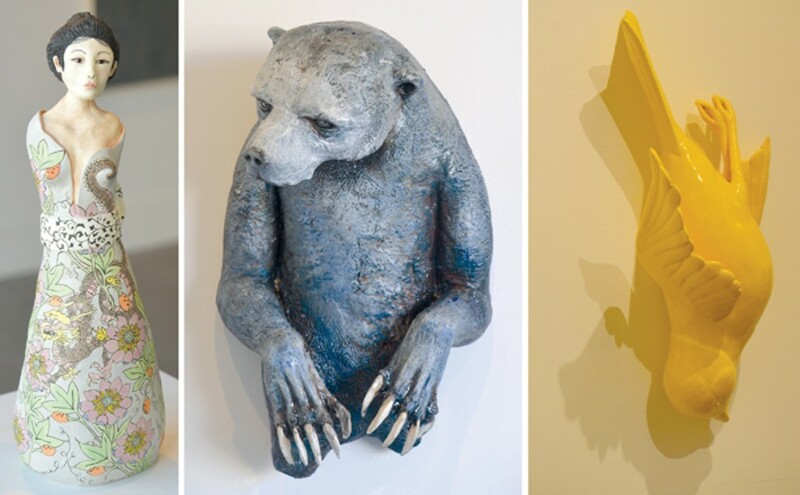 Through March 30 at Roscoe Ceramic Gallery (473 25th St., Oakland, 510-515-3174, RoscoeCeramicGallery.com). 3. Steve Goldband and Ellen Konar: Vast, brilliant photographs of dreamscapes far beyond this mortal coil. The sum of the series is strikingly better than the individual prints. Pacific Rim Exposures runs through March 31 at Photo Gallery (473 25th St., Oakland, PhotoGalleryOakland.com). 2. Christy Kovacs: Fascinating images made of woven paper that transcend textile and become something more than drawing, more than painting, and certainly something more than collage. Woven Through Time runs through March 30 at Vessel Gallery (471 25th St., Oakland, 510-893-8800, Vessel-Gallery.com). 1. Joseph Kowalczyk: In his ceramic wall hangings, Kowalczyk presents a complete fantasy world where all our childhood fears and desires are entertained. Savior, Scarecrow, and Spirit of Ancient Past runs through March 31 at FM Gallery (483 25th St., Oakland, FMOakland.com).